The lesson of our Gospel reading this morning is very simple: Say “thank you”! The lesson is simple, but the consequences are profound. Our failure in this simple but essential act is at the root of so much of our woes. Consider only the news of the past week or so. Fact: 2014 was the hottest year on record! Fact: whole species of life are becoming extinct every day because of human activities. Fact: terrorist attacks are now an everyday reality in most parts of the world. And I can go on and on. But let these suffice from the headlines of the past week as a taste of our reality today. Why are we destroying the planet? Why? Because we do not give thanks. Because we are not grateful for this marvelous gift that God has given us: Life on this amazing planet. We are not grateful, we take things for granted, we believe that we have the right to destroy whatever we want. And we destroy our interpersonal relationships because we take each other for granted. We are not grateful for each other. And that’s a sin. All failures to give thanks are SIN. Have you noticed? Science fiction films are increasingly dystopian – the opposite of utopian, analogous to dysfunctional. The prefix dys– in Greek serves to destroy the good sense of a word or increase its bad sense. ou–topos as opposed to dys–topos, etc. Metropolis perhaps was the original film representation of a dystopian, bleak future. But think of most popular sci-fi or futuristic films. All paint bleak pictures of the future. What is their message? Pessimism. And yet, Christianity has a different view, though depending who you talk to and how you interpret certain passages of the Bible. There are Christians who believe the world is going to be destroyed, so it doesn’t matter to them whether we kill all life and whether we pollute or destroy the atmosphere. But many other Christians – including the Orthodox – believe something else. When Orthodox speak of deification/theosis, we don’t just mean an achievement of individuals. We mean more than that; we mean cosmic deification. Human beings cannot be separated from nature, from the cosmos. Saint Paul again, in Romans 8, tells us that all creation – all of nature, the cosmos – waits with anticipation for the liberation of the human children of God and will share the same glory as we! Dear friends, it doesn’t get much clearer than that. What do we bring to the table? Faith, hope and love, those three great virtues that Paul names in 1 Corinthians. And the greatest of these is love, he tells us. But what is it that enables us to live by faith, hope and love? The ability to give thanks. How can you have faith, if you can’t say thanks to God for the gift of life and salvation? How can you have hope, if you can’t give thanks for the present? And how can you have love, if you can’t appreciate the importance of people in your life? Words are important. Tomorrow is Martin Luther King Day in the United States. 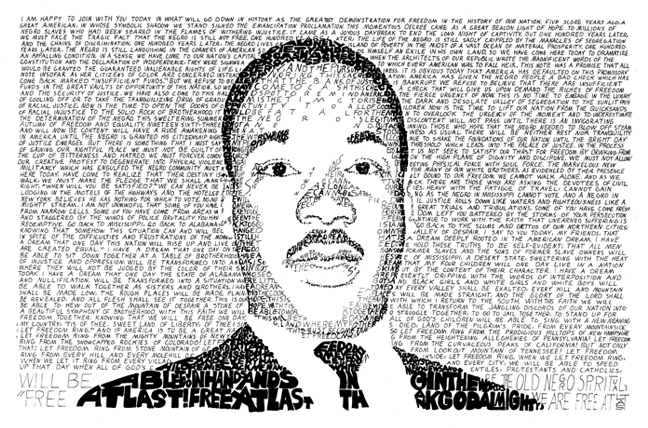 I love the graphic of his image that is put together from words that he spoke or wrote. It’s brilliant, and it illustrates how important words are. Our words form the image that others have of us. Let words of thanks compose the image we present to the world. Learn from the tenth leper and give thanks. It’s very simple, yet so profound and it affects everything. Imagine if 6 or 7 billion people in the world every day practiced the art of giving thanks! Who would kill? Who would abuse or take advantage of others? Who would be pessimistic about the future of humankind and the planet? Jesus lamented, why did only one return to give thanks? Where were the other nine? Let us pray that those words are not spoken about us too. Categories: Sermons | Tags: cosmic transfiguration, Deification, dystopian images, gratitude, healing of ten lepers, Martin Luther King Day, Thanksgiving | Permalink. A very important passage indeed. I often think about it. Thanks for posting it.